Flicker Alley is proud to present the following essay by Kendahl Cruver of A Classic Movie Blog, written for Detectives and Dames: A Flicker Alley Noir Blog-a-Thon! Too Late for Tears (1949) and Woman on the Run (1950) are available now on Blu-ray/DVD! Order today! Note: This essay contains spoilers for Too Late for Tears and Woman on the Run. 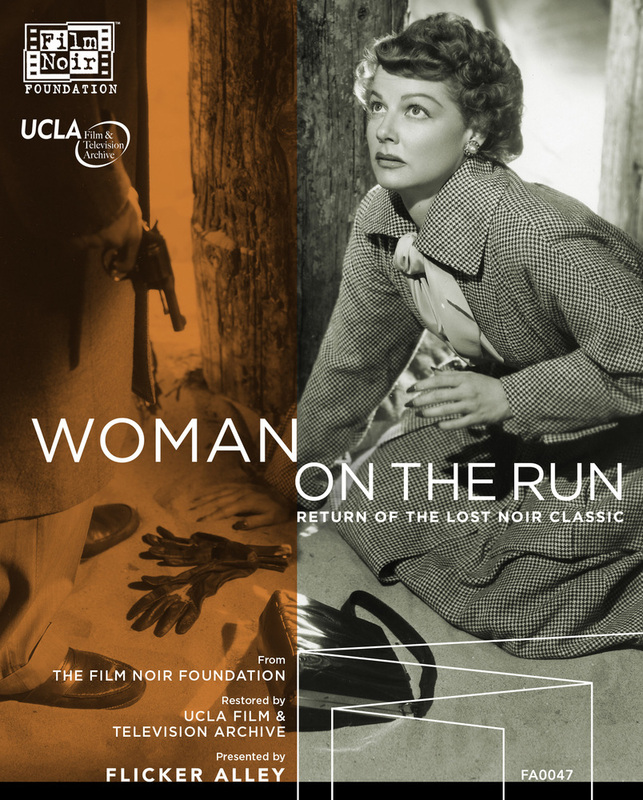 I know it wasn’t very noir of me, but I cheered when I learned that restored versions of Woman on the Run (1950) and Too Late For Tears (1949) were going to be released on DVD/Blu-ray. That the Film Noir Foundation and UCLA Film & Television Archive were teaming up with Flicker Alley to do the deed just sweetened the deal. These are people who can give forgotten or underseen films the respect and treatment they deserve. Here’s hoping this is the start of a long relationship. Often a restoration is applauded because it grants access to a film that was long unavailable. This is not the case with Woman on the Run and Too Late for Tears. These noirs have been in the public domain for several years. When films are in as shabby condition as these pair were though, it is almost as if you’re not truly seeing them at all. In this case, they had enough magic to them that you couldn’t look away, even if it wasn’t always easy to stick with them. By simply enabling audiences to appreciate these films fully, the restorations are of great importance, but there are other elements which make them fascinating as a pair and tie them together thematically in an unusual way. Despite the familiar types of the femme fatale, and the good girl looking to save her sister/clear her boss’s name/etc., film noir is often a man’s game. Here you have two noirs that are focused on women: one a heroine, the other a villain. And the kind of women that they are is also novel; while they are dramatically different morally, these are ladies with one significant trait in common: they don’t apologize for not living up to society’s expectations, not even in the last minutes of the films. 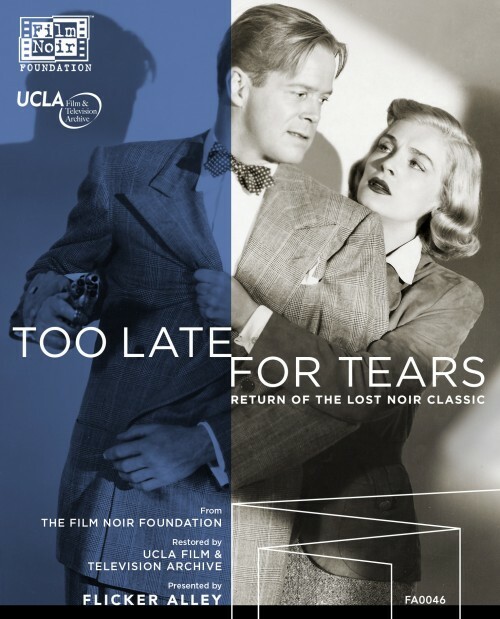 Before watching these new releases, I was most familiar with Too Late For Tears, which I had watched on several crummy public domain discs, somehow thinking that one might be better than the rest. The first time I saw it, I didn’t understand the complexities of film preservation and restoration. For some reason I thought that all good films would of course have to be properly cared for. It didn’t occur to me that even the best of films could be crammed with ten others in a cheap DVD set for sale at the grocery store. That’s why I was shocked to find that Too Late For Tears was so good. How could this amazing noir not be treated like a classic? As top notch as the rest of the production is, it’s hard to imagine Too Late For Tears having as much of an impact if it weren’t for Lizabeth Scott. I hear that in later years she claimed not to love her performance here, but I think it is her best. As a housewife who mistakenly has a suitcase full of cash thrown into her car, and then protects the illicit gain like a mama bear with a cub, she is all steely focus and false smiles. The money is her ticket to the respectability she craves, and she will be completely unrespectable to keep it. One of the most remarkable things about Scott’s performance is that she makes you feel for her. She’s a vicious sociopath who will kill supposed loved ones for cash, but her desire is so much more intense than anyone around her that you can’t help wanting her to succeed. In her world there’s nothing like a comfortable life to make one desperately crave a world of luxury. When she sees her opportunity to escape buying furniture on the payment plan and worrying about bills, nothing else matters. Though she is playing a villain, there must have been ladies in the audience who felt vindicated by this woman who pursued her dreams with unapologetic passion. She doesn’t wait for a man to tell her what to do, she gives the orders, and she knows exactly what she wants. Scott is supported by a strong cast, including Don DeFore as a sketchy stranger with an interest in Scott and Kristine Miller as her sister-in-law. Dan Duryea stands out as a criminal—and intended recipient of the money—who realizes quickly he is in over his head with Scott. He’s playing the same scumbag he always does in crime flicks; it’s just that this time he has met his match, and it’s pretty amusing to watch him deal with it all. Of the two films, Woman on the Run was the one I felt was most in need of attention. I only ever managed to get through it once before because the picture and sound quality were so bad I had difficulty getting lost in the story. At the time, I thought it was an interesting noir, but I didn’t feel the need to struggle through it again. In its restored version, you can finally appreciate the mid-century San Francisco location shooting and the nuances of Ann Sheridan‘s performance that were lost to shoddy public domain presentations. This is one of her best roles, because she gets to discard some of that big studio glamour and fully display the grit and sharp wit that made her an intriguing star in the first place. As a wife in search of her missing husband, whom she is on the brink of leaving, Ann Sheridan is equally unapologetic about her unconventional ways, if exponentially more heroic. Hubs has taken off after dodging a bullet from a murder suspect, so the cops want to talk to him. Sheridan just wants him to take his heart medicine once she learns he has been hiding an illness from her. A wisecracking supposed newspaperman played by Dennis O’Keefe insists on helping her so he can get an exclusive and is a good target for her quips. Done with love and romance and quietly sad about her failing marriage, Sheridan is numb and weary. When the police ask why there are only dog food cans on her kitchen shelves she says, “I’m lazy, we eat out.” The comment is meant to be as depressing as it is funny, but you can’t help but wonder how many women of the time admired the liberty she had taken. Sheridan’s disappointed housewife doesn’t grin and bear it, but she doesn’t come off sour for acting as she feels. In fact, it makes her more sympathetic. How often do you see that sort of freedom in any character, let alone a female? Woman on the Run, while mostly of a noir flavor, successfully dips into many genres. Sometimes it works as a comedy; at times it is as chilling as a horror flick. At its core though, it is a drama about a frail marriage; just the sort of movie you always planned to avoid, but if you did in this case, it would be criminal. There are more noir collaborations to come if this first partnership between Flicker Alley and the Film Noir Foundation is a financial success! Both sets come with DVD and Blu-ray discs. They include booklets full of photos, stills and advertisements connected to the films and essays that shed a little more light on the films and the restoration process. The sets also contain several short features about the making of and restoration of the films. Film Noir Foundation President and “Czar of Noir” Eddie Muller provides the commentary track for Woman on the Run, while Alan K. Rode, film historian/programmer and a director of the Film Noir Foundation, comments for Too Late for Tears. Remember to order Too Late for Tears and Woman on the Run and save 25% off MSRP through Monday, May 16!